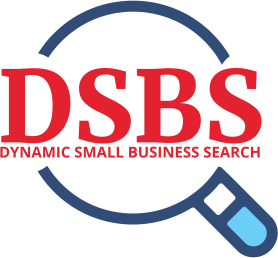 The Dynamic Small Business Search (DSBS) is a database created by the Small Business Administration (SBA) where you can enter and search for small businesses who are registered in System for Award Management (SAM). Businesses registered in SAM are eligible to do business with the federal government. The information listed in the Dynamic Small Business Search is a combination of data pulled directly from your SAM registration and information manually added inside the DSBS database. Contracting officers in the United States are required to spend 23% of their contracting dollars on small businesses. Sometimes, when a contracting officer needs a small business to fulfill a contract, they will use the DSBS to find the business. Think of your company DSBS profile as an another government marketing material. If you don't update your DSBS, your business will not show up in any searches. If you don't show up in any searches, your business could be missing out on contracts. Since the government is required to award a percentage of spending dollars to specific set-asides (woman-owned, HUBZone, 8a, etc. ), the Dynamic Small Business Search is one of the main tools contracting officers use to find these businesses. The DSBS profile is set up when processing your SAM registration. Many businesses skip this step in their registration, which hides them from the public search. When contracting officers want to find businesses who are registered to do government work, they search via the DSBS. As a vendor, you can use the DSBS to research competition or find subcontractors. The bottom line – the DSBS is the yellow pages for contracting officers, and you want your business listed. We help our clients complete a DSBS profile, register in the System for Award Management, and put in place the tools they need to succeed as government contractors.